Vicky's 3-year-old, Melanie Rose, is incredibly bright and outgoing. Melanie loves to swim, sing and dance. She loves adventures and enjoy learning new things. Her favorite movies are Disney’s CoCo and Frozen and is always singing the soundtrack of CoCo (especially “remember me”). 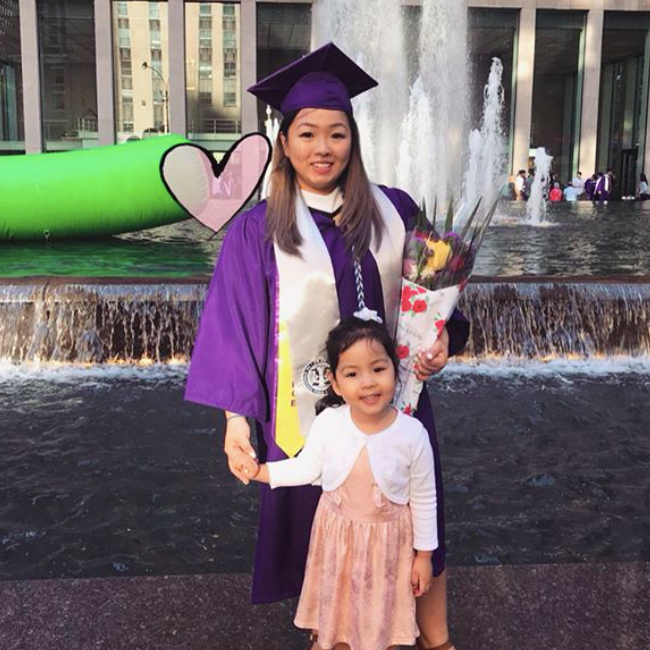 As a part of the student-parent task force, Vicky would like to improve the experiences of all student-parents and those on the verge of becoming student-parents. She hopes CUNY will utilize her field research work to inform decisions about resource allocation for students with children. Vicky would also like to implement clear-cut policies for CUNYs. Additionally, she dedicates her work to ensuring that all college campuses provide nurseries and safe spaces to breastfeed. Overall, she would like student-parents to be able to succeed without worrying about childcare, and feel comfortable and as if they belong in a campus setting. She would like to continue her studies in psychology and hopefully one day achieve a PhD or PsyD in Clinical Psychology. She is currently working as an advocate for the Asian Women's Empowerment Program through Womankind, and part time as a behavioral therapist, teaching ABA therapy to children with developmental disabilities, such as Autism Spectrum Disorder. Vicky dreams of opening up her own practice, which will allow her to provide therapy to individuals, children, couples and families who suffer from mental illness. Her ultimate goal is to abolish the stigma of mental health and assure that everyone has access.